For the summer of 2019, the designers are relatively unanimous: The trend color yellow goes into another season and presents for the coming summer in a clear, warm variation. This color is complemented by a pastel pink or old pink, which is mainly used for delicate textiles, lingerie fashion as well as knitwear. The main trend toward natural colors launched last year ends up in a warm terracotta tone for summer 2019. The designers are quite divided about its name though: they call it either cognac or rust. Checks, already popular for winter, return in strong summer colors in the new season. But this favorite pattern now has strong competition from stripes. Traditional striped fabrics celebrate a revival and even in denim stripes are back. In contrast to the trend colors in warm tones, striped fabrics are translated especially in the classic combinations of blue-white and red-white. In fashion, all styles come back at regular intervals: This season small details of the '70s predominate such as braided belts, large metal eyelets with function and batik and edgy graphic elements. The silhouettes, however, are more influenced by the '80s: The shoulder is further emphasized. Pants come in a mix of a baggy and carrot shape in a very wide cut with patched pockets in workwear style and at some models with stitched center seams. Also a relic from the '80s are the large-scale acid washes, which were used especially in denim. Despite their history from the punk scene, these eye-catching washes today look classy and replace the marble-washed jeans of the last seasons. The must-have shoe of next summer is the cowboy boot, which could be seen even on the finest catwalks during Paris Fashion Week (ex: Celine, Andrew Gn). Since this boot can be combined very well with shorts, minis and long midi floral dresses, it is versatile. In addition to classic models in brown, black and white, there are also many cowboy boots in strong, eye-catching colorblocking. The shoe model is available in three shapes: a low shoe, ankle boots and mid-high boots. Launched a couple of seasons ago by Balenciaga and Miu Miu, funky plateau-sole-sneakers in bright colors took their time to reach the broader market and will make their breakthrough next summer. The offer is large and ranges from the very clean white sneaker to the motley, eye-catching models with several-inch high soles. The great success of floral dresses in maxi or midi length continues. In addition to Victorian-inspired, very romantic ruffled and lace-trimmed models, there are also many dresses that mix flowers with graphic patterns and seem rather clean. As a continuation of the ethno-trend of the last years and an answer to a dwindling acceptance of It bags, bast bags are back in trend. The offer is as colorful as it was in the '70s during the hippie era. According to many exhibitors, big sizes (aka Weekenders) are the bestsellers. A clever take on this trend came from Massimo Palomba, which replaced the palm-made raffia with leather that is worked and braided to look like raffia. It is therefore far more durable than a standard raffia bag. 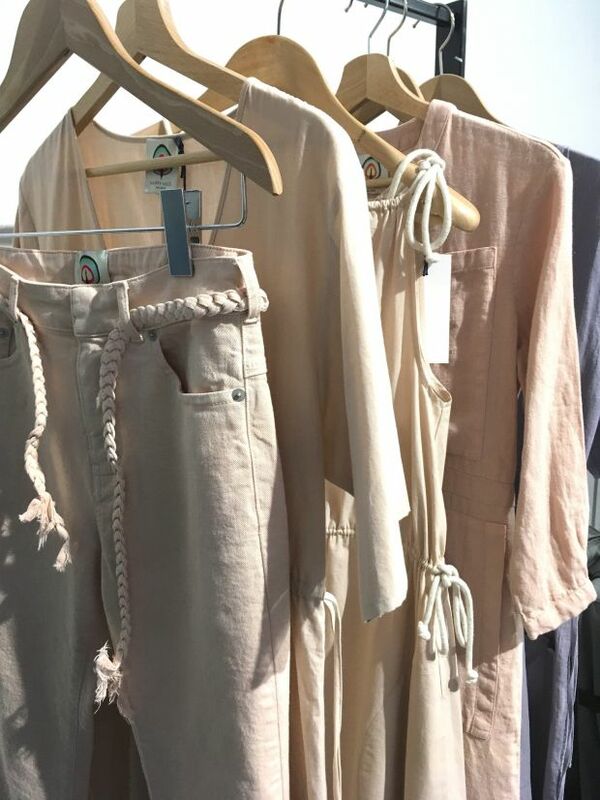 The vegan movement, which comes mainly from the food sector, is also becoming increasingly popular in fashion: Many suppliers, such as the Japanese brand Dollyandmolly, rely heavily on synthetic materials to avoid using substances of animal origin. Other suppliers, who also include the plastic problem in their considerations, pay particular attention to the fact that only vegetable substitutes are used. For example, the bags of Dutchman Iris Maree are made with plant-based artificial leather. The success of the label Off-White and its designer Virgil Abloh with his preference for workwear and streetwear styles inspired many designers this season. Numerous brands evoked street and sanitation workers by strikingly incorporating sewn-on grosgrain ribbons, neon details and reflective elements from workwear as a style element. In addition, the must-have of recent seasons, the hoodie, is therefore still very much in vogue and offered in almost every collection.